Minister of Home Affairs Malusi Gigaba has announced that American gay hate pastor Steven Anderson, and his followers, will not be allowed into South Africa. The historic move follows a determined campaign by LGBT activists, led primarily by GaySA Radio, to stop the preacher, who calls for the execution of gay people, from spreading his shocking views in the country. Anderson, who heads up the Arizona-based Faithful Word Baptist Church, was set to visit Johannesburg with 17 associates in a missionary style excursion on 18 September to “win souls” for his hateful cause. He and his supporters then planned to go to Botswana to set up a branch of his extremist church. Gigaba cited the protection of LGBT people from discrimination in the Constitution and the Equality Act, which bans hate speech, as the basis for his decision. “We have a duty to prevent harm and hatred in all forms against LGBTI, as any other person in a democratic state,” said Gigaba, including, he explained, needing to “prohibit foreigners who are likely to promote hate speech”. Gigaba revealed that not only had he declared Anderson an “undesirable person” under the Immigration Act (as someone who advocates “social violence”), but that he had also withdrawn his visa waiver status, granted to US citizens. 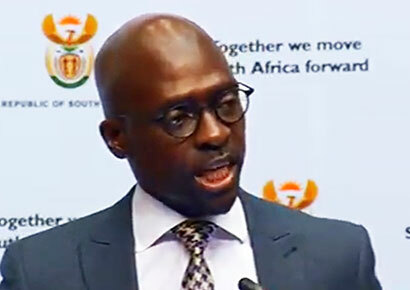 “South Africa does not need more hatred advocated to our people,” said Gigaba, confirming that if the pastor attempted to enter the country he would be detained and deported. The ban is a significant blow to efforts by American evangelists, who are facing growing resistance in their home country, to export anti-LGBT ideologies to Africa. Baird thanked Minister Gigaba “for taking this matter seriously and for coming to the right decision that is in the best interests of South Africa,” and for making “an important statement here today”. He further expressed solidarity with LEGABIBO in Botswana, where Anderson aims to open a branch of his church. “We support you, our brothers and sisters, and we will help you wherever we can. We urge the government of Botswana to protect their LGBTI citizens and take the action required to stop the hate from spreading in that country,” Baird said. He called for 13 September be known as ‘Rainbow Day’, “a day to be celebrated annually as a victory for LGBTI rights in South Africa”. Anderson has stated that killing gay people would free the world from the AIDS epidemic. Most recently, he praised the Orlando massacre as “good news” because “there’s 50 less paedophiles in this world”. Anderson has continued to preach that governments must execute gay people. During the campaign against the preacher, Gigaba was presented with more than 60,000 petition signatures calling for a ban on the evangelist, as well as a comprehensive dossier on Anderson’s activities, compiled by GaySA Radio’s attorney, Coenie Kukkuk. Mambaonline congratulates GaySA Radio, Baird, Kukkuk and the thousands in South Africa and across the world who supported the campaign for their efforts that led to today’s groundbreaking affirmation of LGBT equality and humanity. UPDATE: Anderson has posted the following on Facebook. Absolutely delighted in the news that this hateful preacher and his entourage will not be allowed to enter South-Africa. Long enough have our country been a foothold of hate and intolerance. Mr Anderson should rather turn inward and ask himself if the hate that he preaches is uplifting and positive to society and the world. South-Africans are a welcoming nation, but we have shown Mr Anderson we do not welcome hate to be spread in our country. Well done to everybody who supported the initiative to have Mr Anderson banned from entering South-Africa, and thank you to the Minister of Home Affairs Malusi Gigaba. Well done! I do pray that this man and his followers will realise the error of their ways and repent! Wow incredible news! Today is Rainbow day! I wonder what dear old Rev Oscar Peter Bougardt will have to say – we all know how he loves this site! Always sneaking around, showing an interest in what we are doing! lol! Awesome news that he is banned in SA. There are so many worse stuff going around in the world ,he must rather concentrate of the war around the world. Congratulations to Home Affairs Minister MALUSI GIGABA on Banning Pastor Steven Anderson from South Africa you have made our Nation Proud of You. Congratulations also go to GAYSARADIO & Hendrik Baird & Coenie Kukkuk for all you hard work in getting this Pastor Banned from South Africa. We are all proud of you guys & all concerned in Blocking this Hateful Pastor & followers from Entering South Africa it’s RAINBOW DAY today!!!! Well done to all the persons involved in the banning of this character Steve Anderson from South Africa. Your next Oscar Peter Bougardt shut your mouth !! with your hate and intent of motivating murder in our Country. We are watching you !!!! I look forward to Rainbow Day every year, I have received the best Birthday gift ever. And THAT is how we roll as a NATION!!!! Wonderful, min. Gigaba!!! South Africans are very proud of the constitution that they have fought for for decades…and thousands of people died for. It is their national pride irrespective of race, color or religion. It is a nation that will defend that constitution no matter what…and that is what they just did. The people have spoken…and the government adhered! It is perhaps good karma to mention the 60000 signatures contributed by allout.org members. Awesome wonderful news! Well done to Hendrik Baird, GaySA Radio for all your hard work! It has been a pleasure standing with you on this issue! Fear leads to hatred! He is probably gay himself which is usually the case! God must strike him down for hating his creations!!!! Go does not make mistakes! Fear leads to hatred! He is probably gay himself which is usually the case! God must strike him down for hating his creations!!!! God does not make mistakes! Excellent! Well done everyone for supporting this very important initiative! Let’s continue to keep hatred out of our beautiful country! Minister Gigaba, Hendrik Baird & Coenie Kukkuk – we salute you for championing this cause! Thank you for defending our constitution! Goodness Pastor Anderson’s raiment certainly shook when he was being tazered in that you tube video. Another satans advocate that should be banned with his bible colledges and all in SA is Andrew Wommack – even his website is full of the lies and hate that stated with Constantine and were abused by the religious. You’re happy about banning someone from the country because he espouses views you find offensive? Have you considered the implications of this decision? There’s this vitally important concept called free speech, which is increasingly endangered in South Africa. I may detest this man’s views, but I defend his right to express them.